✿Material: High quality Faux Buffalo leather. USA Brand (Imported): The Designer Handbag using high-quality Faux Buffalo leather, with all stitches in neat and orderly rows. We have always been strict with both the choosing of materials and processing of products, in other words, we are better at material selection and superior in product making, taking every detail into consideration for the dear customers to meet as much as possible their own styles. 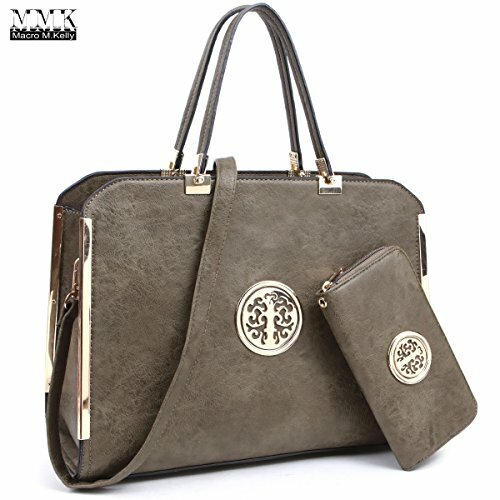 ✿BRAND NAME FEEL AND SERVICE: Own designer beautiful handbag. purse by Macro M. Kelly collection.Our goal is to ensure that you're 100% satisfied with your purchase right out of the box. If you're not satisfied for whatever reason, we will gladly accept your return provided that you request authorization within 30 business days of the delivery date. ✿Size: 14.3"W x 10.8"H x 5.5"D + Handle Drop Length: 6.5'' + DETACHABLE & ADJUSTABLE Shoulder Strap length:45" + FREE Matching Wallet Size: 7.5"W x 4"H x 0.8"D.
✿Detailed Construction: Top Zip Closure + Studded Flat Bottom + Matching Gold Tone Zipper Pulls, Hinges, Accents, and Rings. Pockets: Exterior Back Wall Zipper Pocket, Interior Open top pouch pockets, Interior Back Wall Zipped Pocket. ✿Limited EDTION - Macro M.Kerry Handbag Collaborative Design (This is not MichaelKors Brand). ☆ MMK COLLECTION QUALITY ASSURANC:USA Brand (Imported) ~ The Beautiful Women Satchel using high-quality PU leather, with all stitches in neat and orderly rows. We have always been strict with both the choosing of materials and processing of products, in other words, we are better at material selection and superior in product making, taking every detail into consideration for the dear customers to meet as much as possible their own styles. ☆ EXCELLENT SIZE FOR ANY OCCASIONS: Approx Size: 14.25"W x 10.5"H x 5.75"D, Handle Drop Length: 5.5", Shoulder Strap Length:End to End 45" which means this special design handbag can also be used as work satchel, laptop briefcase bag and even traveling bag. 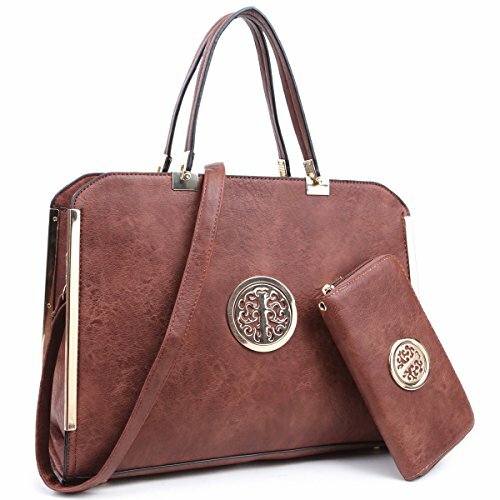 This beautiful handbag for women is large enough for carrying your wallet, make-up, laptop, books and even some mother stuff however still looks so fitting at the same time. Tall Ladies will definitely love the size.